Axl Rose has slammed the Trump administration as the "gold standard of what can be considered disgraceful." 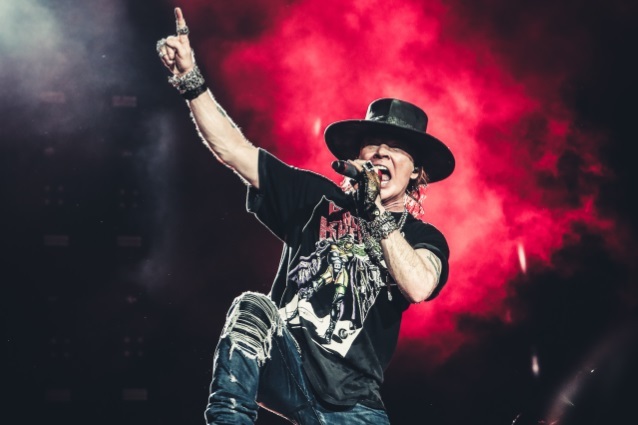 The GUNS N' ROSES singer made his comments in response to a statement from White House press secretary Sarah Sanders about Donald Trump's mental fitness to serve as president. "It's disgraceful and laughable," Sanders told reporters about criticism aimed at the billionaire real estate mogul's mental state. "If he was unfit, he probably wouldn't be sitting there, wouldn't have defeated the most qualified group of candidates the Republican Party has ever seen," Sanders said, before praising Trump as an "incredibly strong" leader. Earlier today, Rose took to his Twitter account to respond to Sanders, writing: "Along with several other condescending adjectives, the current [White House] has no room to call virtually anyone disgraceful. The [White House] is the current U.S. gold standard of what can be considered disgraceful." The renewed questions about Trump's fitness come in the wake of the unflattering picture painted of the President in excerpts from the upcoming book, "Fire And Fury: Inside The Trump White House". Sanders slammed the book, calling it "complete fantasy" and describing it as "sad" and "pathetic." Trump has threatened to take the book's author, Michael Wolff, and his publisher to court in an effort to stop its publication. In response, the book's publisher brought the release date forward to Friday. Wolff tweeted: "Here we go. You can buy it (and read it) tomorrow. Thank you, Mr President." "Fire And Fury: Inside The Trump White House" was originally due to be released next Tuesday. Back in November 2016, Rose took to Twitter to condemn then-President-elect Donald Trump's choice for U.S. attorney general, Alabama senator Jeff Sessions, and to berate Trump for demanding an apology from the cast of the Broadway show "Hamilton" after then-Vice President-elect Mike Pence was booed when he attended the musical. One month later, Rose invited fans at a GUNS N' ROSES concert in Mexico City to beat the crap out of a large piñata designed to look like Trump.